When I was in high school I took an aptitude test in the tenth grade. When the score came back I was called into the office by the school counselor. I remember her asking me what I was planning to do after high school. “My parents were wonderful,” Dian says as she flashes her famous smile. “They were so supportive. Knowing my academic limitations, they helped me get through. “Even in college, my mother would spend huge chunks of time helping me with my reading. She would read aloud to me from the textbooks. I worked both hard and strategically to understand what I needed to know; fortunately, my parents didn’t have unreal expectations for me. “One thing I did in college was to always analyze a class before I signed up for it to determine the amount and kind of reading required, the kinds of tests given, the approach of the professor. My information came from course catalogs and conversations with the teachers, but, most important, from students who had taken the class. Another technique Dian used during her college years revealed yet another hint of her potential as the “First Lady of Creativity,” as some refer to her: she would study the way her teachers tested. Once she saw what teachers based their tests on — lecture notes, chapter review pages of the text, whatever — that is what she would focus on in her study. As I look back in my years at the university, I realize that there are many way to learn. I was great at school as it is more of a left-brain experience. It was my right-brain abilities that came into play when I became a home economics teacher at Orem Junior High after graduating from BYU. I did not teach from books but from experience. If I taught a unit on outdoor cooking, I got my students out of class and we went to the mountain to cook out. Fortunately my principal, Bennett Nielson, loved the way I taught and gave me a double green light to give my students learning experience instead of rote learning. After three years I was given a scholarship by the home economics department because of my creativity. This allowed me to go back and get my master’s degree. I once again struggled with classroom learning but managed to write my thesis on how to teach outdoor cooking in the classroom. Home economic teachers from all over the state of Utah came to learn what I had created in my junior high experience. The class was taught through special courses and conferences. The director gave me the use of his secretary, who had been one of my campers at the Brighton Girl Camp where I had been director. She loved my ideas and took what I wrote and polished it for publication. I went to BYU Press to see if they would print my manual. They told me that if I would sign a paper saying that I would purchase any that did not sell, they would print 400. I remember the amount was as much as I made in a year. I decide that nothing ventured was nothing gained, and I signed the paper. I then went out and got myself a job traveling with BYU Education Week, which took me across the country. My manual soon sold the 400 and they printed another 400, and they sold, so they offered me a contract and a writer to help me put all of my ideas together. 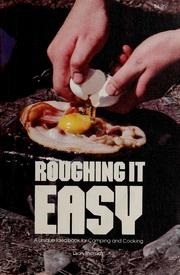 On March 28, 1974, forty years ago, I stood at the big press at BYU and watched as my first copies of Roughing it Easy came off the press. I remember standing there and wondering if this book would change my life. It was just one year and two months after that when I stood on the stage of “The Tonight Show with Johnny Carson,” where I entertained him and an audience of millions and showed them how to start a fire with steel wool and batteries, how to boil water in a paper cup and how to cook eggs and bacon in a paper bag. In the weeks to follow, Roughing it Easy went to the top of the New York Times bestseller list and the door to media entertainment opened wide. I stepped into a career that would take me to a regular job on the NBC “Today Show” for eight years, then the ABC’s “Home Show” for six years. Then I went to “Home and Family,” which now plays on the Hallmark Channel, and which I still do when I go to Los Angeles. Now I see that I was smart all the time but my intelligence was not through book learning and rote memorization — it was in experiencing life and sharing that with audiences around the world. Next week I will travel to Halifax, Nova Scotia, and spend that week talking about preparedness with the LDS stake and sharing with the Halifax Chamber of Commerce how to do media. Life had a different path for me than being an auto mechanic. I am so glad I did not listen to the school guidance counselor, but that I was able to listen to my inner voice and follow a different direction.